It is a question that the red half of the Mersey have asked themselves for sometime. Their club has been without a domestic championship for too long and many of their fine fans felt that this could be their year… They even somehow managed to blot out the fact that they had uttered such sentiments the year before, and the year before, and the year before. At least they had some incredible runs in Europe to ease the pain and to provide a genuine spark of enthusiasm and rekindle their belief that they could soon rule the Premier League. Statistically it wasn’t foolish optimism or chirpy sentimentality – under Rafa Benitez the club had made significant steps forward and had they not have fallen to so many draws against lesser opposition, this whole train of thought would be moot, nothing more than a tale of footballing history through the looking glass. 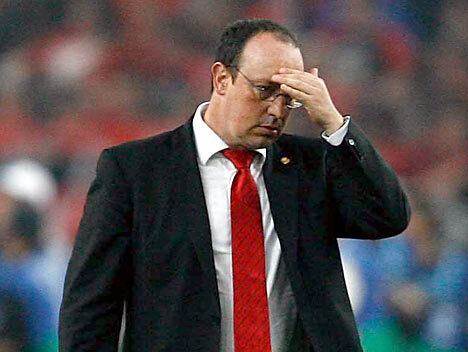 But this season Benitez has the look of a man bereft of ideas, incapable of altering his – and indeed Liverpool’s – destiny. The season has already become a hideous train-wreck, unfolding in slow motion, piece by piece, casualty by casualty. I haven’t seen anyone look so utterly doomed, both hopeless and hapless, since the days of Graham Taylor in charge of England. We all know what is coming and even the most staunch of Liverpool fans must now be asking themselves “how long lord, oh how long?” once more, but for very different reasons. It is clear to all but the most blinkered of fans that he hast hit the wall and not only has the club ceased to make forward progress, it has now come screeching to a halt before finding only the reverse gear as it frantically tries to keep momentum going. Everyone who knows the game knows there is a huge difference between a genuine title challenge and simply making up enough ground after the chance has gone to make it look respectable. Benitez isn’t capable of delivering anything but the latter, but now a great club is faced with the real prospect of being overtaken by the likes of Manchester City, Tottenham and Aston Villa in that scramble for Champions League revenue. Benitez may well publicly decry big spending clubs, but even he must be conscious of the hypocrisy loaded in such hyperbole. Let us not forget that this a manager who has been allowed to spend 220 million pounds to build a side that is over-reliant on two players, and he inherited one of those. Would such frivolous spending be tolerated anywhere else? Certainly not at the clubs he has criticised where managerial turnovers are common if expenditure is not directly proportionate to success. It is not even as if you can say he has a particular eye for talent. Liverpool fans groan when they see some of his purchases on the team sheet, they know what they deliver week in and week out. How can someone capable of winning a Champions League trophy let a player with the engine and raw talent of Sissoko go for what would be considered chump change in the current climate? How could he honestly believe that selling the elegant and gifted Alonso and replacing with Gareth Barry would be a wise decision? Yet that is a move that was touted for so long that it became a large part of why the Spaniard left the club for better opportunities. And he also has been the author of the greatest of footballing mysteries – just what is it that Lucas brings to the table? Even the most generous of spectators are baffled. Is he a good man manager? The evidence would suggest not, based on the fact that earlier in the season he publicly criticised Gerrard, a player who always bleeds for the cause and has been the sole reason behind so many Liverpool victories down the years. He has even delayed key players from getting much needed surgery and lay-offs in his bid to try and salvage something of the season, a tactic no manager should have to resort to. A player will always be resentful of their long term future being risked by even the smallest percentage, especially if that cost is only to achieve mediocrity. Of course, it isn’t all bad, I’m not so hard nosed I can’t find good things to say about Benitez, but they aren’t relevant in the here and now. The slump that Liverpool find themselves in is one that needs to be addressed and soon. The transfer window opens in January and a new manager with fresh ideas, players to offload and a bit of money to spend could transform the club and at least make fourth spot a realistic goal. But there is a bigger nightmare ahead than just no Champions League next season if that is the outcome. Even players as loyal as Gerrard will find their loyalty tested come the Summer if Liverpool look nothing like a title challenging club for yet another season. What then for the future? Much like Taylor you feel he has entered into that territory where one decision going against him could cost him his job. Football is too cruel a game for that position to be maintained for too long without catastrophic consequences. In this instance though Benitez’s loss will be Liverpool’s gain.